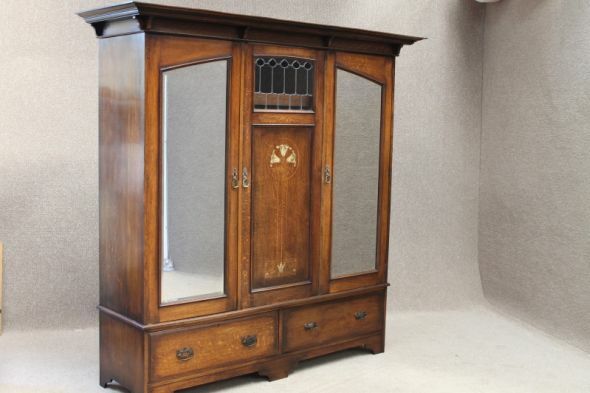 A truly magnificent piece of classic English arts and crafts furniture. This beautiful solid oak throughout arts and crafts wardrobe features a traditional out swept cornice. This leads down to a beautiful central glazed and inlaid mirror door. This opens up to reveal numerous slides and drawers. This is flanked by two large glazed mirror doors which open up to reveal internal hanging rails. The whole wardrobe sits upon a large section holding two deep and useful drawers and standing on bracket feet. This piece is in excellent condition for its age, with just a moderate amount of everyday wear and tear. Please note - two of the handles on one of the bottom drawers have been replaced at some stage during the wardrobes lifetime. They are in keeping, however, not a perfect match. This arts and crafts wardrobe breaks down into five individual sections for ease of transportation and reassembly.